The character " 学 " can be generally translated as "learning" or "education" or "study," and is often read as "gaku." The genesis of the restaurant was our vision to bring delicious, real ramen to college students and college towns. The name tries to capture that inspiration. What is that greeting? In Japan, whether you are walking into a noisy, packed bar or an upscale, boutique clothing store, customers are greeted with shouts of “irrashaimase.” Like most ramen restaurants, we like to try to give our greeting a little punch to get you excited for your Gaku Ramen experience! 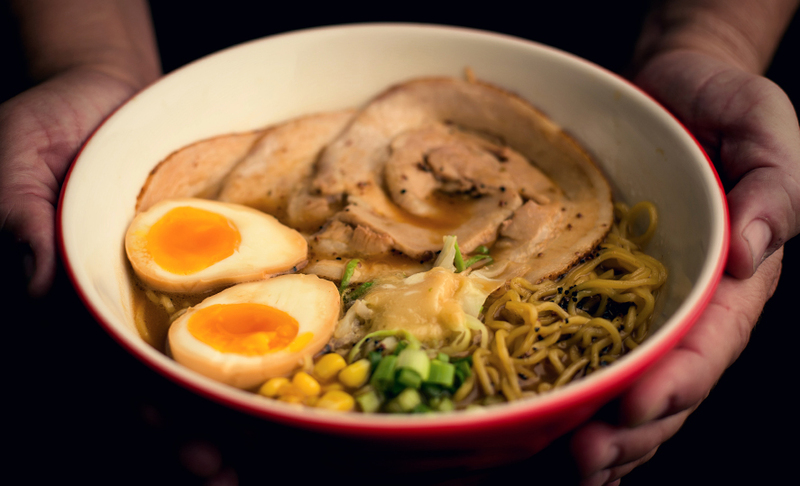 Gaku Ramen offers authentic Japanese ramen, the ultimate comfort food. We use nothing but the freshest ingredients to create our traditional ramen offerings. We are singularly focused on the authenticity of what is in the bowl and on the plate. At Gaku Ramen we take great pride in our Japanese chic yet comfortable atmosphere, in our authentic Japanese ramen and other delicious dishes, and in our our curated drink menu featuring Gaku signature cocktails and a range of sake and craft beer. Check out our Gallery and see for yourself.